"Gerald, what are you doing on January 11th of next year?" we were asked. "I like to plan ahead, but that's six months from now. I can't think of what I'm doing then, why?" "We're having a tasting of our Cabernets. We want you to join us." "Okay...I'll put it on my calendar. I'm getting old...don't forget to remind me!" 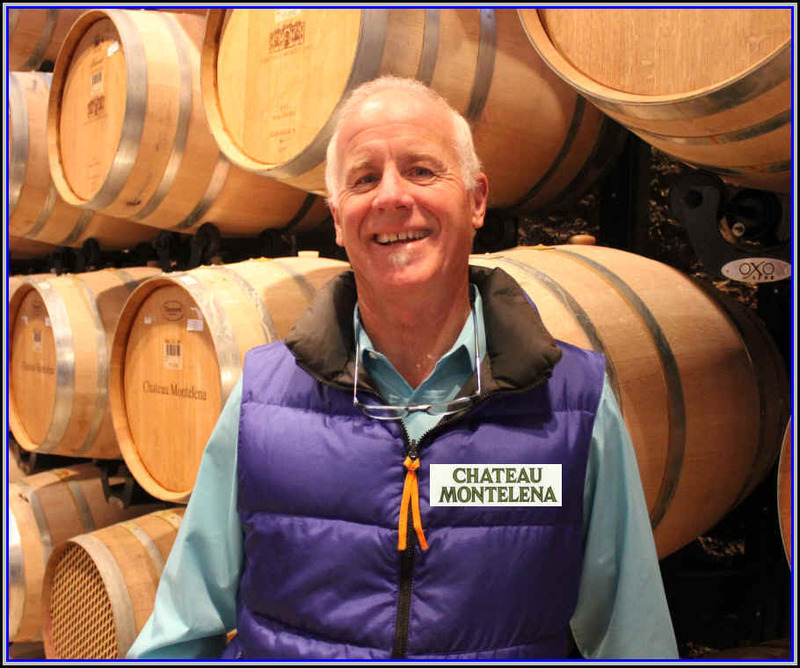 Brian Baker, Montelena's "Road Warrior" and Sales & Marketing Vice-President. We have had Montelena's wines since their maiden voyage, the release of a 1972 vintage "Johannisberg Riesling." Yes...back in those days, Riesling was a normal part of a Napa winery's line-up. Montelena, with winemaker Mike Grgich, had its first wine ready for the market and we were amongst the first customers. We recall Montelena offering a lovely Chardonnay shortly thereafter. Winemaker Mike Grgich, always sporting a beret and a twinkle in his eye, would tell people "You may find this Chardonnay to be different and having a sweet element. But it's not sugar...it's simply a bit higher in alcohol and this contributes more texture to the wine." Montelena made some lovely Zinfandels in those days, too. We have fond memories of their 1973 vintage, a wine which did not undergo a malolactic fermentation. As a result, perhaps, it retained a purity of fruit which was quite remarkable. Yes...they made a bit of Cabernet. Maybe more than a bit, as they ended up creating a lower-priced secondary label to attract customers. This was called "Silverado Cellars." 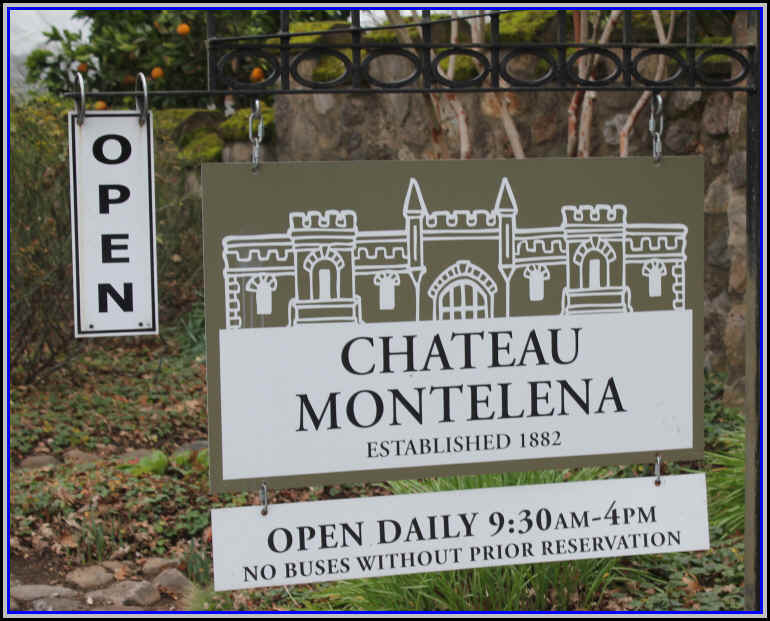 Montelena planted Cabernet Sauvignon in Calistoga <finally>, though winemaker and winery CEO Bo Barrett said many people thought Calistoga was too hot for Cabernet Sauvignon. "There wasn't much Cabernet in Calistoga when we started. We had Mondeuse and Carignane. We had Sauvignon Vert and Chasselas. We planted Cabernet and didn't use the generally recommended AXR-#1 rootstock. Our vineyard guy, John Rolleri, was a proponent of the St. George rootstock and this turned out to be a great move." While many vineyards were planted with AXR #1, it turned out to not be strong enough to resist the root louse, Phylloxera. As a result, many plantings from the early 1970s were impacted and Napa Valley growers had to replant thousands of acres of vineyards. The Napa Valley Vintners web site, though, notes Calistoga as being hotter than Oakville, Rutherford and St. Helena. But a US Climate Data web site shows while Calistoga's Average Month High Temperatures are 1 to 3 degrees higher than, say, St. Helena, for example, the night-time lows are also a few degrees cooler, giving Calistoga a greater diurnal swing. Barrett spoke about how they are often picking the late-ripening Cabernet Sauvignon before their friends farther south in the Valley. 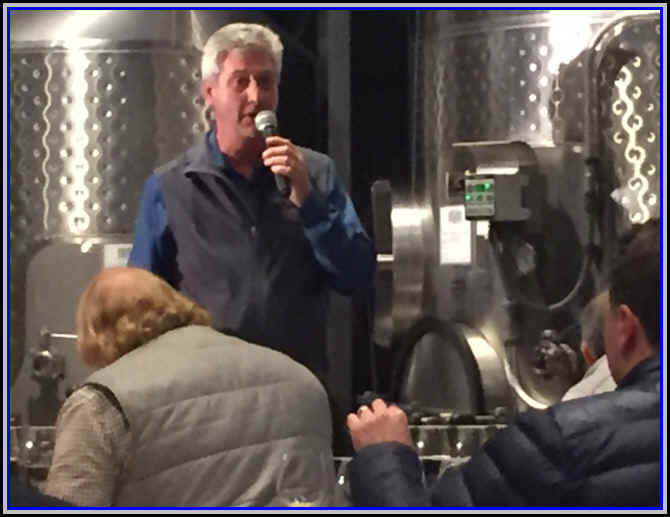 Brian Baker welcomed everyone to Montelena. Weimax, you see, was one of their first customers for Montelena wines. We had purchased the 1972 Riesling and the famous 1973 Chardonnay. Then things turned serious and we set about tasting their wines, going from the oldest vintage to the youngest. 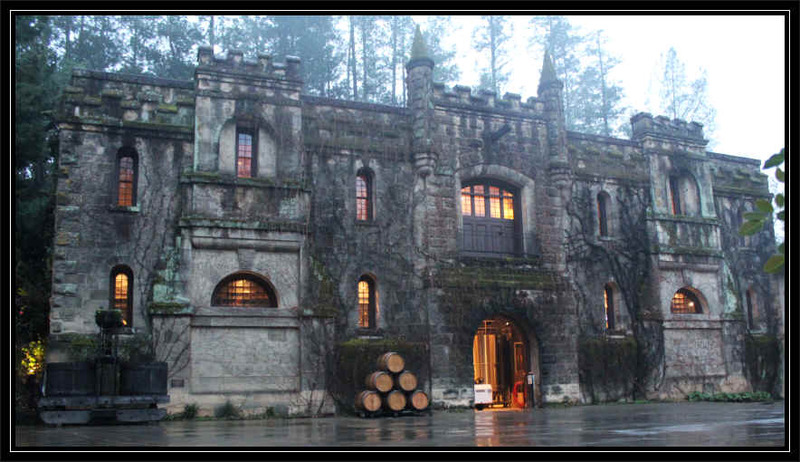 Montelena blends its Cabernet with but a tiny amount of other Bordeaux varieties. Merlot, Barrett explained, "doesn't grow well in the Calistoga area as it does best in clay soils and we don't have those here." These days you might find one or two percent of Cabernet Franc in the wine. Maybe a drop of Petit Verdot now, too. If you see the photo above, you'll notice Alluvial, Volcanic and Sedimentary soil samples. While many winemakers use various grape varieties in an attempt to create a wine that's viewed as being more complex than something that is made of but one grape type, Bo explained that with the various soil types in the Montelena vineyards, they have plenty of varying "components" with which to work. "We used to conduct a seminar called the Inter-Relationship Between Soil and Wine Quality. 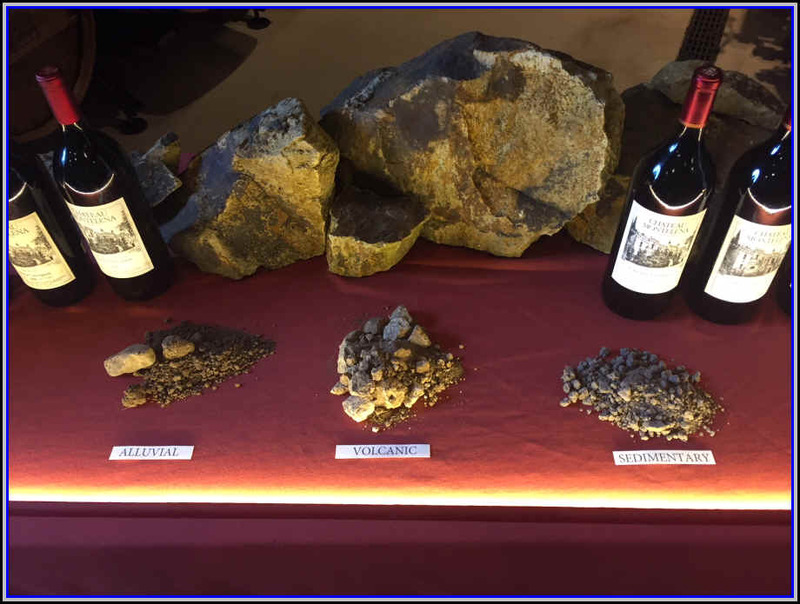 We could show off differences in samples of Cabernet resulting solely from various soils. Heck, we didn't know back then it was called terroir." 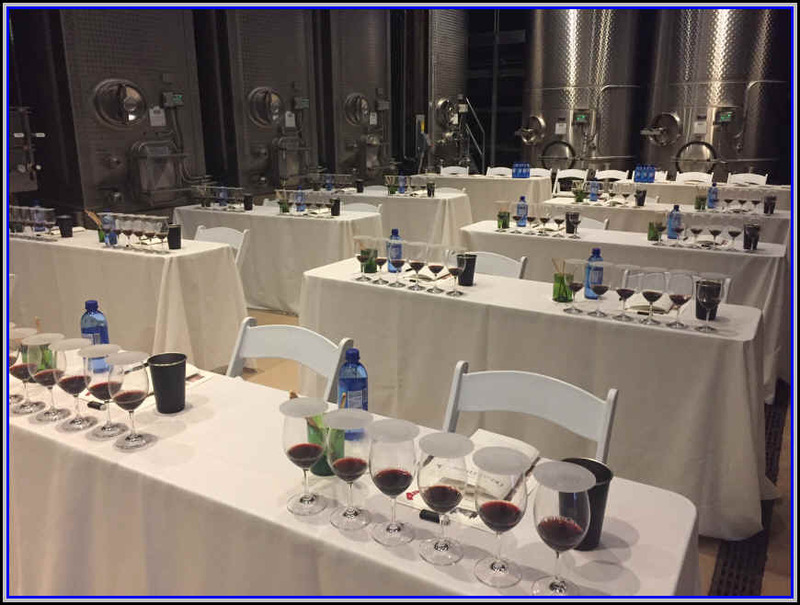 The cellar was filled with tables and glasses of Montelena Cabernet Sauvignon. We would taste wines going back to the 1974 vintage, on forward to 2013. 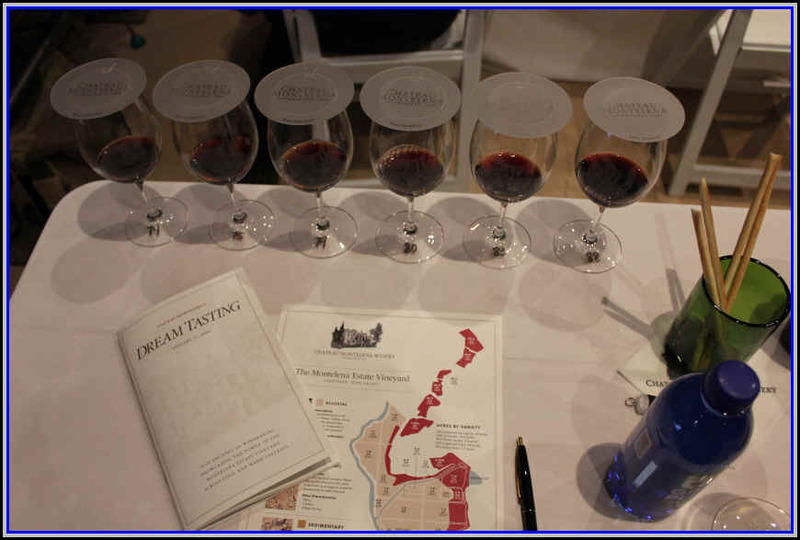 That's certainly a "Dream Tasting." The wines, by the way, were all poured from magnums. Barrett said while these are reputed to age more slowly than regular-sized bottles, he doesn't find much difference in how Cabernet ages in one or the other. "For Chardonnay, yes, a magnum does age more slowly and there are differences in old vintages from a regular bottle to a magnum." 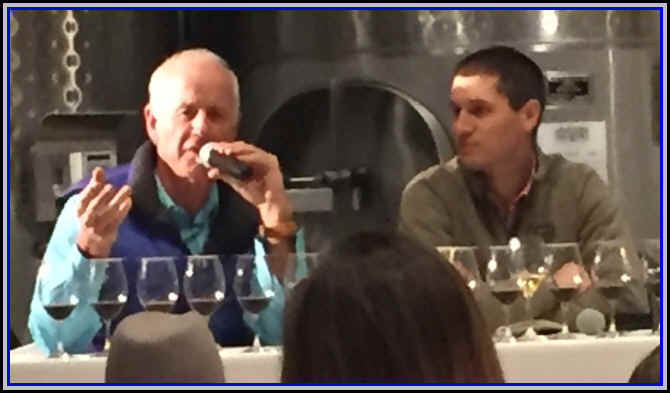 "This retrospective tasting isn't just about Chateau Montelena," Barrett explains. "It's about my generation of winemakers. We started in the 1970s and have seen all sorts of vintage conditions and used all sorts of equipment and cooperage. We learned a lot starting out and then so when the 1990s came along, we were ready to strut our stuff with a string of remarkably good growing seasons." He spoke about the "early years before Parker's Wine Advocate" and how he had participated in road-show tastings with Robert Parker. It seems that while Parker liked the Montelena wines, wines of higher "octane" received higher scores. 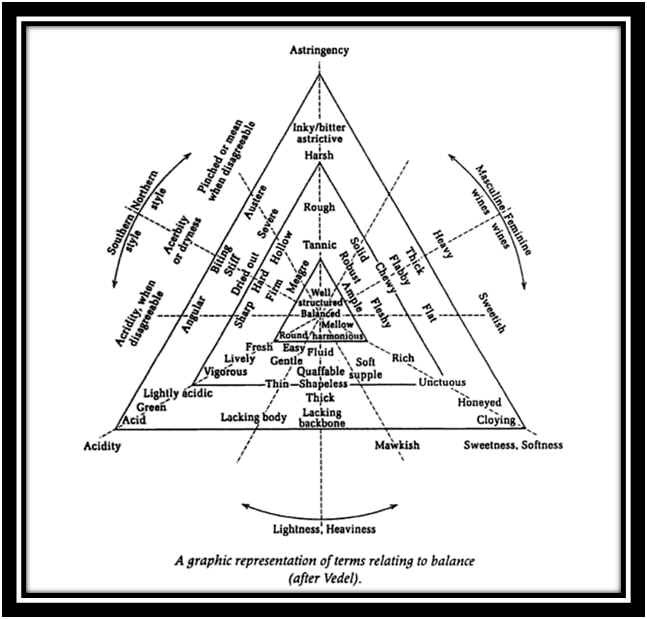 Barrett says Montelena always kept in mind the "triangle" chart created by the late French enology professor Emile Peynaud. He routinely advocated wineries only pick good quality grapes. This seems rather basic, but half a century ago many wineries threw everything into the fermentation tank. Today wineries ask harvesters to be selective in their picking, but also have sorting tables or optical sorting machines. Peynaud suggested managing tannin extraction in a particular fashion and he advised winemakers to pick grapes at a somewhat greater level of maturity so obtain softer tannins. These days, though, with wine critics equating alcohol, power and intensity with quality, things have often gone to extremes. In the 1970s people spoke about the Peynaudization of wines. A decade, or so later, people spoke of the Parkerization of wines. 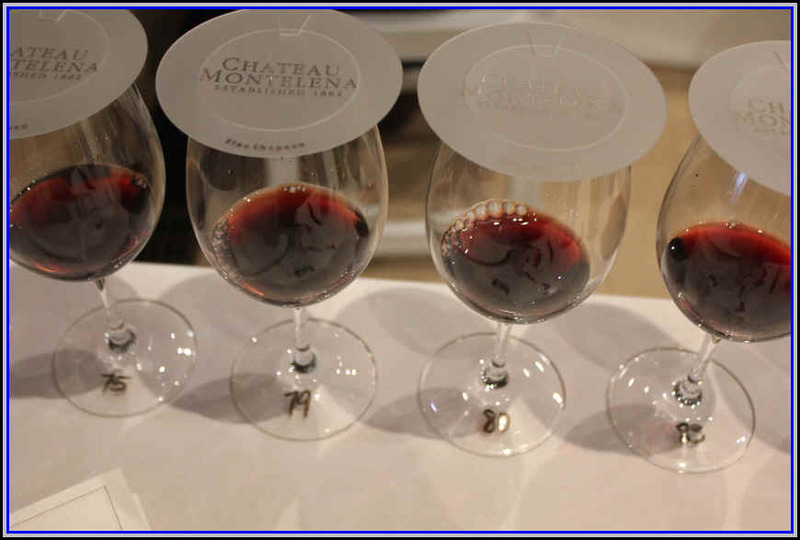 As we saw in tasting five decades of Montelena's wines, they have not succumbed to chasing fashion and changing how they made wine to accommodate the market. "My father (Jim Barrett) didn't like those big, heavy wines with 15+ percent alcohol and some residual sugar. He said we should stick to our style as people will eventually grow weary of those big fat wines and come back to us." 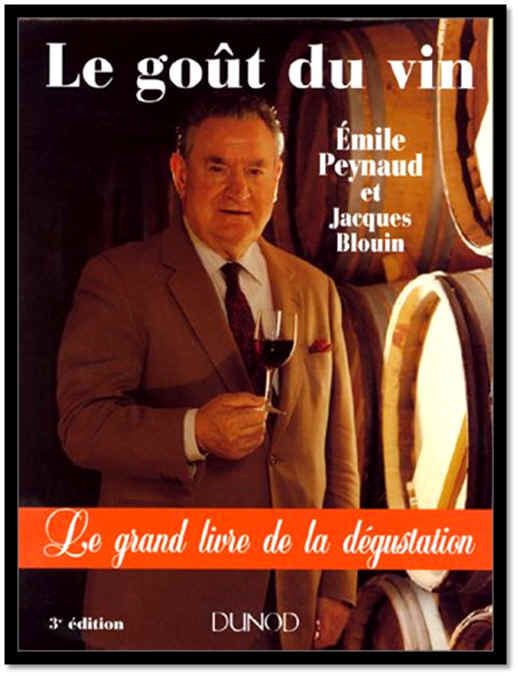 Peynaud also favored temperature-controlled fermentation, something of a novelty until the 1970s and into the 1980s. He also encouraged a sufficiently lengthy maceration period for red wines and Montelena used to leave its wine in contact with the skins for a month or longer "back in the day." We began with the 1974 "Sonoma" Cabernet Sauvignon. Barrett noted the fruit for this wine came mostly from Sonoma's Alexander Valley, hence the Sonoma appellation. "We had Mondeuse and Carignane in our own vineyard and I wondered whatever became of that fruit...then I looked in the register and saw they sort of disappeared..."
The wine had a gorgeous fragrance with some earthy tones and a woodsy quality. Medium bodied and with a measure of finesse and elegance. The finish is round and almost creamy. Bo mentioned they had incorporated a little percentage of stems when fermenting this. This was made using fruit from both Napa and Sonoma, hence the North Coast appellation. Barrett said they typically harvested when the grapes got to 23 degrees Brix (a measure of sugar) and this one came in at 22.8, producing a wine of 12.4% alcohol. It has some fruit from Rutherford, as they purchased grapes from Shown & Sons, whose vineyard was sold to Heitz (who now makes a single vineyard wine called "Trailside"). Mike Grgich was the winemaker at the start of the 1975, but it was finished by Jerry Luper. The color was medium-light ruby and it showed a red fruit fragrance, less woodsy than the 1974. There's a crisp, edgy feel on the palate...still good and rather elegant. We recall the 1974 vintage as being more highly praised than the 1975s, but as these hit the 25 to 30 year mark, many '75s were showing better than the '74s. The 1979 vintage saw a couple of challenges from Mother Nature. As the vines were flowering, hot winds beset the vines causing "shatter" (Coulure in French). This means the flowers are not pollinated and grapes do not form. They calculated a 40% loss in fruit. While this is not ideal, a small crop hits maturity faster given a normal growing season. As a result, they picked their Cabernet earlier than normal which was fortuitous as there was rain in late September. Barrett spoke about the long macerations they typically employed, but Mr. Luper preferred a shorter time "on the skins, so this spent maybe 10 days instead of 40. Clone 6, a shy-bearing Cabernet, produced a wine with remarkable black fruit notes which are still evident today. I thought this was one of the best wines of the tasting today. Complete from start to finish. I recall this vintage as quirky...Summer was a bit cool and most of the ripening, if you want to call it that, came about when hot temperatures arrived in September. This put sugar levels ahead of actual physiological maturity. Some Cabernets had green notes to them along with raisiny tones, the worst of both worlds. This wine was medium ruby in color and the nose showed some slightly tarry notes. The fragrances were more complex and the wine was a bit murky on the palate. The texture was good and the wine is certainly smooth today. Barrett mentioned they had been using some old cooperage during this time period and perhaps that accounts for the tarry elements. Still, it's a good wine, but perhaps overshadowed by others. A wet winter, heat spikes during the summer and untimely rain during the normal harvest time period proved challenging for many wineries. 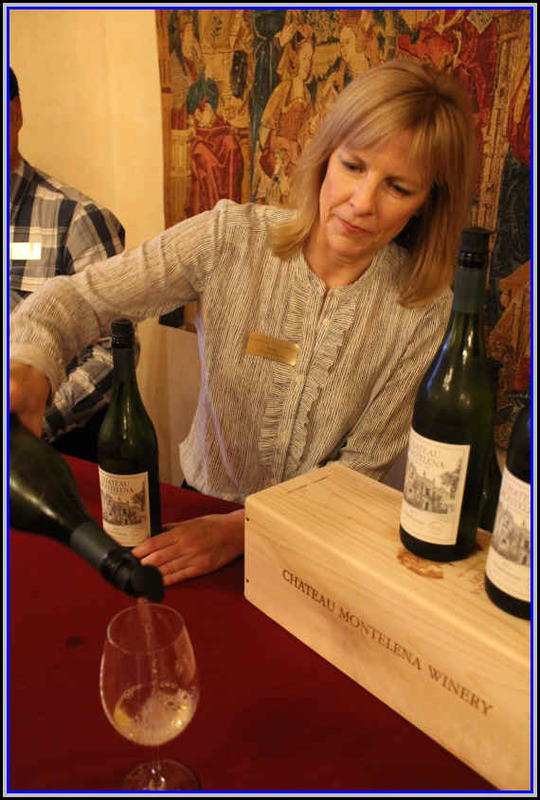 Montelena stared picking fairly early in 1983, though, as vineyard yields were meager. The harvest took about a month and Montelena began its harvest in mid-September with warm temperatures occurring into October. This wine was a most pleasant surprise, though. Good color and still a bit youthful. Plenty of bright red fruit fragrances and the flavors confirm the elements promised on the nose. Fine on the palate and complete. It still has a bit of "grip" and should continue to age handsomely for a number of years. Barrett credited experience in dealing with the drought years of 1976 and 1977 with producing the 1987 and 1988 vintages which were also fairly dry. Yields were tiny, weighing in at perhaps half the normal 2.5 tons per acre. "The 1987 vintage was definitely a 'Parker' vintage as the wines were concentrated and powerful. By 1988 the vines, though, were quite stressed, producing tiny berries and brittle stems." Bo said they had an old crusher/stemmer machine and the wine was quite tannic early on thanks to these dried stems. In fact, this vintage caused Barrett's father Jim to give the green light to purchasing a new de-stemmer for the 1989 harvest. This wine still has its tannic edge, which may account for its vitality as it nears age 30. 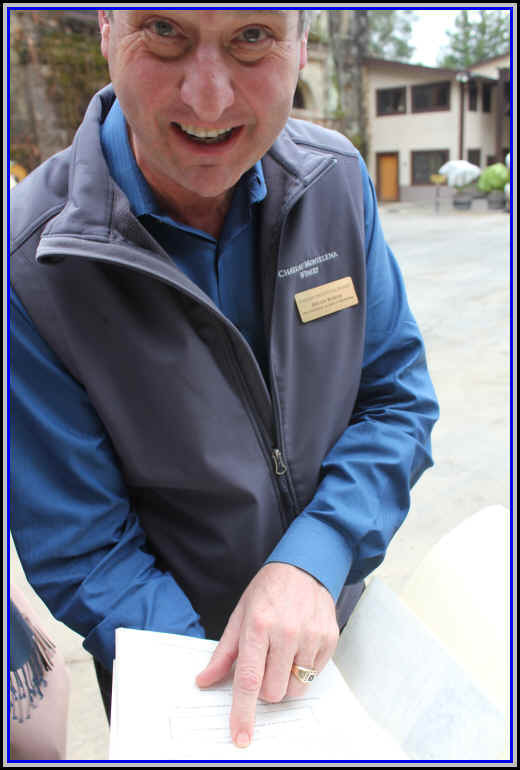 Continuing his discussion on Cabernet, Barrett lavished a heap of praise to current UC Davis enology professor Dr. Hildegard Heymann. "Her work regarding pruning, green harvesting and leaf thinning to discourage the green bean and vegetal notes (methoxyprazines) in Cabernet and to bring out more red and black fruit character is truly a seminal work." said Barrett. Barrett mentioned this as being another dry growing season except for heavy rains around Memorial Day in May when the vines were in bloom. The untimely rain resulted in a severe crop loss, but a somewhat early start to the picking season. "The 1990s were remarkably good growing seasons and for winemakers of my generation, people such as David Ramey, Randy Dunn and myself--with our experience over the previous decade, or so, we knew how to handle these vintages. By the 1990 vintage we had confidence in our winemaking and we believed wholeheartedly in what we were doing." Having that new crush-pad equipment didn't hurt, as this vintage saw no inclusion of stems during the fermentation. I found the nose of this wine to be beautifully complex with nice dark fruits. The wine on the palate, though, did not quite live up to expectations as this struck me as a bit shallow in the middle. There's some nice structure, though and it has a mouth-drying finish. When I returned to this after a bit, it seemed to have improved with aeration and it was showing better. Montelena now was able to use some hillside vineyards in its Estate Cabernet. The growing season had been fairly cool in spring and summer, but a heat spell in August was helpful to growers. They had a fairly good crop level and began picking Cabernet in mid-September. There's plenty of ripe, dark fruit aromas here and maybe a hint of a brown spice tone. I found good fruit all the way along on the palate, too, with good intensity in the middle. Very fine. Bright fruit on the finish, as well. This is a beautifully polished wine and it's a profound wine. Classic. Barrett once again credits experiencing dry years in the 1970s and 1980s with dealing with the 1996 growing season. There was shatter in May and a smallish crop to deal with. A series of repeated heat spikes in June, July and August pushed the fruit along in terms of sugar before the grapes had physiological maturity. September, though, saw cooler temperatures and this hang-time allowed the grapes to achieve a point of balance. Montelena's Cabernet harvest began on September 10th and continued for a month. This was another exceptional wine. Good color, beautiful fragrances of dark fruits...earthy, berry notes and nice length on the palate. Bo spoke about the 1990s wines being, currently, in some sort of stationery orbit. They're nicely developed and complex with no signs of becoming "old." "I wish we could use no new oak at all." Barrett opined. "But, remember that when Mouton Rothschild started using all 100% new oak for its wine, it became elevated to First Growth status. How about no new oak and let's see who's got a great vineyard?" he asked. "Oak all tastes the same," he continued. "Raisins all taste the same, too. But we work in the 'fresh fruit' medium. 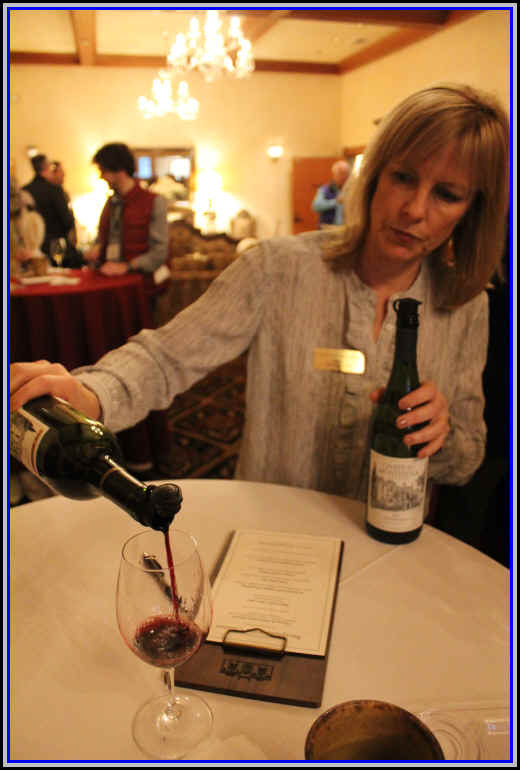 You won't find sur maturit� in our wines", Barrett said, trotting out his best French. "We're kind of outliers in that regard." Bo mused. This was a cold & hot vintage in that there was frost which damaged the vines early on and then seriously hot temperatures during flowering resulting in a small crop yield. The main growing season, though, saw moderate temperatures during the summer and an early start to the harvest. Medium ruby in color, the nose of this wine was quite pretty with lovely black cherry fruit in the spotlight. You would not know it was matured in wood, as there's virtually no oak on display. Barrett emphasized the lack of stems during the fermentation and their aversion to seed tannins. "The 2001 was high in tannin anyway," he told us. "We have more tannin from the skins." This was another candidate for "Best wine of the tasting." This wine, by the way, had received a notoriously bad review from The Wine Spectator's critic, James Laube. Well, the wine did not display the dill notes found by Mr. Laube and its cedary oak must have totally integrated with the fruit. We found a very polished, balanced, elegant wine. Mr. Laube did not note any elements of mustiness in his initial, 69 Point review. Yet he wrote a piece saying he noted this flaw when conducting blind tastings and admits that he is quite sensitive to this mustiness called TCA (the chemical compound 2,4,6-trichloroanisole). There must have been 35+ "experts" participating in this lovely event and not one person said anything about their sample of the 2001 being "corked" or musty. An early bud break combined with a cool and moist spring gave way to a fairly mild June with a bit of precipitation followed by warm temps in July and August. September was fairly cool, allowing for good hang-time. It got hot, though, in late September and the Cabernet hit somewhat high levels of sugar. Barrett noted "the weather could not have worked out better if we had custom ordered it." I detected some slightly herbal notes on the nose here and then a hint of a jammy quality. The fruit is reminiscent of strawberries and plums. It's a medium-bodied Cabernet and while enjoyable, I didn't find it to be quite as profound as many of the other wines. Barrett described this vintage as a "Goldilocks" growing season. "Everything was 'just right'" he explained. It showed fairly deep ruby color and had lovely red and black fruit notes, if a tad riper than some others. This ripeness corresponded to it being a shade lower in acidity. Red fruits on the palate...very fine and complete with nice balance for immediate enjoyment. It's elegant and supple in texture...showy. 2010 CHATEAU MONTELENA "ESTATE" CABERNET SAUVIGNON"
The 2010 growing season in early summer was one of the coolest in memory, with people wondering "Will we ever have warm weather?" A cool start to the year and wet weather in spring caused late flowering. Cool temperatures into July saw slow progress in the vineyards and then a sudden burst of heat caused some issues with sun burnt grapes. This blast of warm weather took care of crop-thinning. Fairly heavy rains in October and some frigid temperatures in mid-to-late November caused headaches for many growers. Despite this, Montelena, with winemaker Cameron Parry at the helm, made a good wine. Medium ruby in color and with a hint of cocoa on the nose, there's a ripe tone to the fruit here. Perhaps it lacks a layer of complexity and there's a softness to this gentle Cabernet that makes it appealing at this early stage. The 2011 vintage was another headache, if perhaps bigger than 2010, for growers. The season started late and it was cool virtually all the way along. This really slowed down ripening and Barrett credits decades of experience with their making a good wine. "We dropped a lot of fruit," Bo explained. "We don't have a mandate to pick Cabernet really ripe. It was, though, a tough vintage. We picked late despite the fact that we have an early site." The nose of this wine is very charming showing sweet, high-toned fruit. There's an almost floral quality to the fragrance here. Hints of cinnamon are present with nice, mild tannins and a very long finish. They didn't make much, we were told, but this was a delightful surprise and a good reason to burn a vintage chart. Winemakers had plenty of good luck with the 2013 vintage as the normally late-ripening Cabernet Sauvignon was ready to pick while tanks were still full of fermenting Chardonnay and other fruit. Winemakers were thoroughly delighted by the quality of grapes this year. 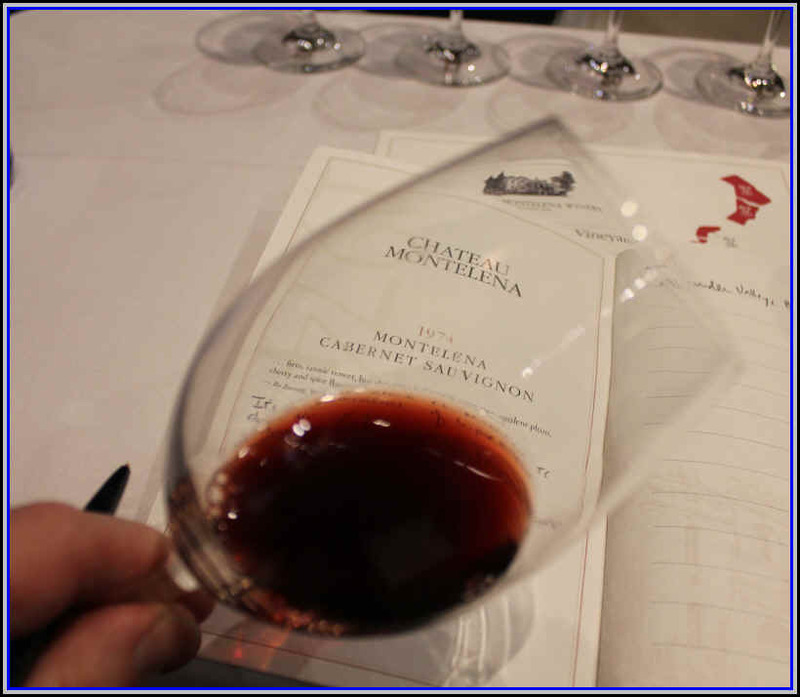 Montelena's 2013 is rather dark in color, a hallmark of this vintage. Ripe fruit. Medium full on the palate with dark fruit notes on the nose, too. It's young, reasonably firm and lengthy. After tasting so many nicely evolved wines, this one shows terrific potential but it's a bit shy and quiet at this early point in its development. We'd be confident in saying this will blossom quite handsomely for those who are patient. Barrett tipped his cap to Montelena's customers. "You know, we don't have software, high-tech or oil money here. This place is paid for by our customers; people who enjoy our wines. We want to continue to make people happy by making good wine." The tasting then concluded, but there were two more wines we could try before heading home. The 2011 Montelena Chardonnay was another pleasant surprise. Remember many people will tell you 2011 is a poor vintage and it should be by-passed. Taste this wine and you'll see otherwise. Mildly toasty fragrances waft from the glass with a hint of ripe peach and melon...very charming and showy Chardonnay! Montelena's 2015 Estate Cabernet was also quite charming. It showed lots of bright red fruit aromas and nice balance on the palate...it's a bit precocious presently. Who knows if it will close up at some point? for the invitation to this memorable tasting.